If you’ve never ridden a large capacity modern scooter you’re missing something, they’re just so good at what they do. 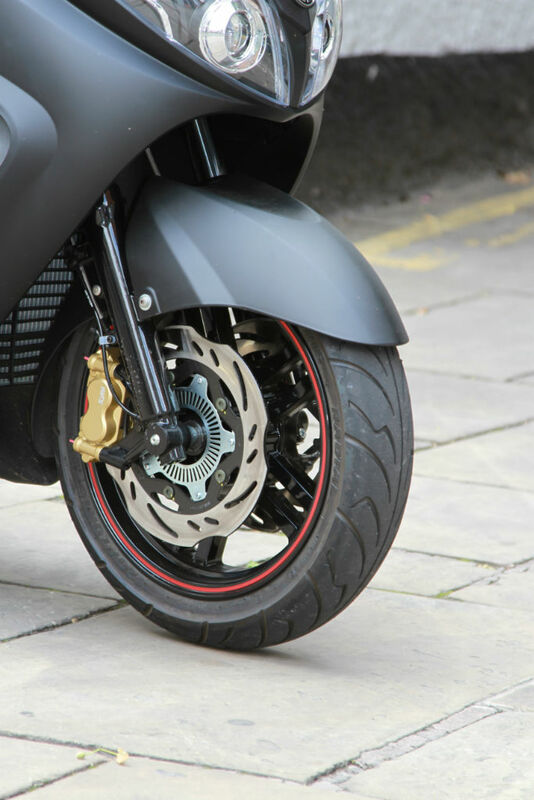 They can munch the miles in perfect comfort, don’t cost a fortune to run and are much more useable and easy to live with than most bikes on a day-to-day basis. Price is one key area that stops Brits buying them but they don’t always have to cost the earth, take this Sym Maxsym 600i for instance. 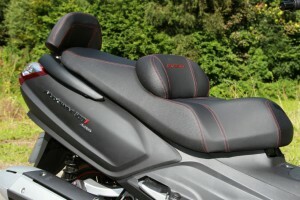 It costs just over £6000 on the road, comes with two years warranty, ABS, has great comfort and mean looking styling. It’s also built very well, despite the Taiwanese manufacturer not being a name most ordinary bikers will recognise. Don’t let that put you off though because Sym are a huge global brand with an impressive history and great reputation. The Maxsym 600i sits alongside its smaller capacity stable mate the Maxsym 400i and shares the same styling and much of the equipment. That’s not a bad thing though because both scooters are well equipped. The 600 features a 565cc fuel injected, liquid-cooled engine. That lump has auto transmission, as you’d expect and makes 40.63bhp. It’s not a huge power figure but the single cylinder machine doesn’t feel underpowered. This is a 110mph (on the clock at least) beast that will quite happily cart you to the South of France whilst maintaining the kind of comfort levels you’d expect from your favourite reclining armchair. You can sit there in feet forward comfort, with a nicely padded backrest and sumptuous seat soothing away any aches and pains whilst you and your contented passenger blast through far off continents (or at least a trip to Skeggy for a bag of chips). Like all modern scooters the Sym has some useful storage space beneath the seat, this one isn’t huge but the shape allowed it to swallow two full face Arai’s quite easily, the scooter also has a lockable glovebox with USB point and 12v socket, plus a couple of handy cubby holes. 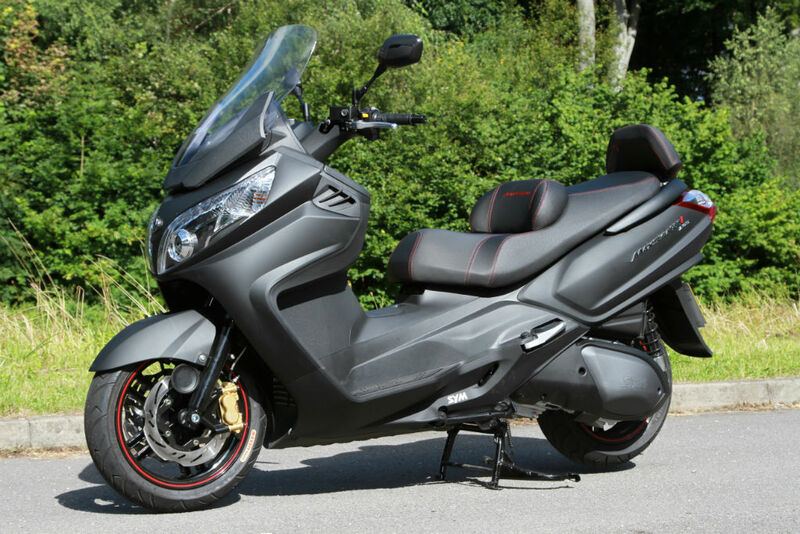 There is an option to add a Givi rear carrier and top box if you need more storage, to be honest that’s an option you will need if you plan on using this scooter for weekends away or touring holidays. 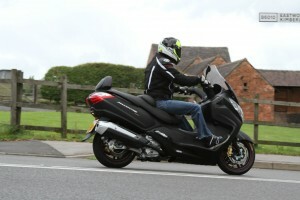 All in all the Sym Maxsym 600i is a great and welcome addition to the maxi scooter class. It’s perfectly capable, looks good, is built well and at around £2500 less than most of the competition it means you can afford to have a few touring holidays as well.